This is more of a concept how to, and you can apply to many different devices but with the same end results. 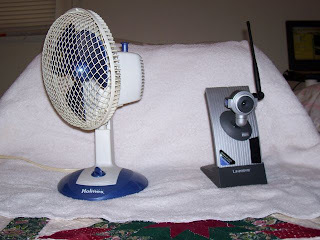 Take one small table top oscillating fan and one Linksys WVC11B 802.11 Wireless camera and combine them. As a concept though it doesn't have to be restricted to a table top fan, as any oscillating type fan would work just as well. The same can be said for the camera, a wireless camera reduces your wire management, but a wired camera can work just as well. And as you will notice I am sure, this is not designed for stealth, but for functionality. Now as your fan and camera my vary, use what you have on hand. What your going to achieve is a camera that will pan from side to side in the arc of the fan oscillation. Why... well because you can? Seriously you may want to set a cam to pan an area for surveillance or just a every day web cam. Be creative in what you use it for, as well as how you affix the cam to the fan. I used a large rubber band, but I can see this being done with duct tape, Velcro, wire ties etc. However you mount the camera to the fan, just insure it is secure, and will not fall off during normal fan operation. BONUS: Most oscillating fans will be multi-speed, so you may have a choice of panning speeds. DOUBLE BONUS: You get some cooling and air flow from the fan. See the below video link for a sample of what it looks like in motion.